Paul Hayne is a Research Scientist in Geophysics and Planetary Geosciences at NASA's Jet Propulsion Laboratory, California Institute of Technology, where he investigates the nature and geologic histories of planetary surfaces and atmospheres using spacecraft observations and physical simulations. 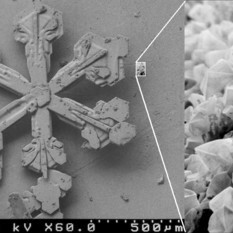 He recently completed a Ph.D. at UCLA, with a dissertation titled, "Snow Clouds on Mars and Ice on the Moon." 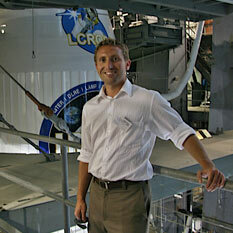 This picture was taken shortly before the launch of the LRO/LCROSS mission to the Moon. Paul escaped just in time. 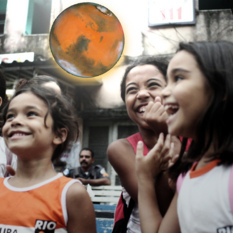 A new project—"Mars Academy"—aims to expand the cosmic horizon and offer a broader sense of opportunity for at least one group of underprivileged children in an impoverished neighborhood in Rio de Janiero, Brazil. Paul Hayne, representing the Facebook group "Young Scientists for Planetary Exploration," urges you to take action to support NASA in the budget debate.